I pull into the rest stop and am surprised to see that I've parked next to a car with Washington plates. It has been over 3 weeks since I've seen a car from home. This state has received an over abundance of funds for rest stop signage so they have utilized the money to post the evils of allowing pets to set foot on their property. "No Pets", "Keep Pets off the Grass", "Take Pets to Other Side of Street", "No Pets in Building", the signs say. They stop just short of saying "YOU! With Your Evil Dog! Go Play In The Freeway!" The urge to take Arayo onto the banned side of the street to do her business is overwhelming. The gentleman from Washington State returns to his car as I am getting Arayo out of mine so I ask what town he is from. What follows is a life story. A 50 year old "dried up musician with no money and nothing to offer anyone", reconnected recently with a girl he had had a crush on when he was 15. "Classmates" is an amazing service, it seems. Turns out she had been in love with him all these years and she has always held a place in his life. She doesn't care that he has had a string of bad luck. She wants him just the way he is, so after 2 months of phone calls, he left 3 days ago and is moving back to the east coast to join her. I've noticed another man watching us as I've carried on this visit with Mr. Romance. His big grin reveals two teeth and it looks like his last shower was last month but he gives me - okay, really Arayo - a big smile and waves. I ask if he would like to visit with her and he nearly jumps up and down with excitement as I bring her to him. (I nearly jump up and down with excitement, knowing I'm breaking the state's "No Pet" regulation, but I dare anyone to interrupt this "therapy" visit.) He and his wife (who has matching teeth) have 4 dogs of their own, but none as big as Arayo. We chat about the love and loyalty of a good dog, then I cross to the approved side of the road and let Arayo take care of business. 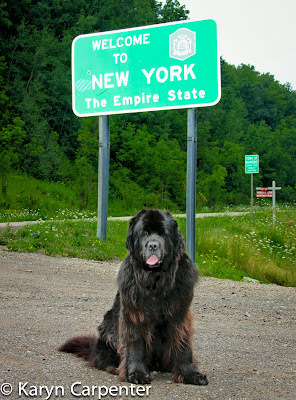 This big dopey Newfoundland is my magic act. Like pulling a rabbit from a hat, she always bridges the way for conversations and smiles with a wide crosssection of people. Photo: Not all States have "welcome" signs n convenient places. We crossed into NY on Monday and have moved on to MA. I am waiting for my call. Email me and I will send you my phone number if I didn't do it already. NUTS! I had in my head that you were in NH. Grrrrr.... I may have driven right by you. I'm in Northern VT right now. RATS RATS! I might have been tempted to add to the signage, something about dog hating state. Although if you are a celebrity and your dog fits in a purse, you may be more welcomed.